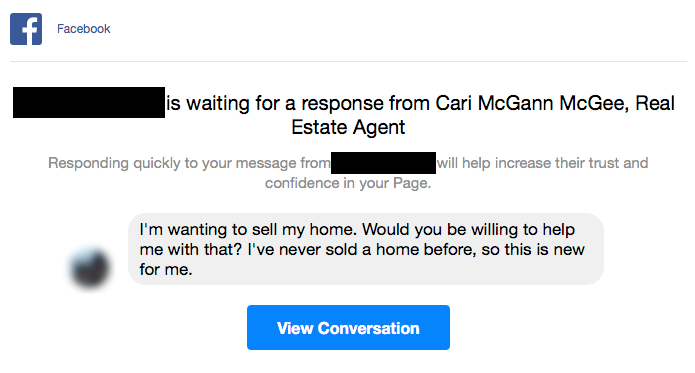 Who Says You Can’t Do Lead Gen On Facebook Messenger? My wife woke up a couple mornings ago and found this email notice alerting her to a new message waiting for her in Messenger. I’ve blocked the name for privacy reasons … suffice to say it’s a complete stranger. Best of all, it’s a legit lead. My wife’s made an appointment to visit this person and inspect the home as part of the initial listing/pricing process. I hope we’ll learn how and what prompted the connection on Messenger. I suspect it’s traceable back to the Facebook advertising we do, which is mainly a case of turning her weekly Ask the Realtor videos (which discuss all things related to Tri-Cities real estate) into video News Feed ads. They tend to get seen by a few thousand people each week.